"It's dangerous to go alone! Take this." is a quotation and Internet meme from the 1986 video game The Legend of Zelda for the Nintendo Entertainment System (NES). [nb 1] It is spoken by an unnamed old man, met in the very first cave of the game, who gives the player-character Link a sword to help him on his quest to defeat Ganon and rescue Princess Zelda. The quote has spawned a number of variations and has been a popular image macro. The most popular use as an image macro was an image of a kitten in someone's hand with the quote added to the image. The quote has also been used by a number of websites for titles to articles. IGN positioned it at #27 on their top 100 video game moments list and claimed that the scene was the best example of the exploration element found in The Legend of Zelda. GamesRadar featured it in its list of the 40 most repeated video game quotes as well as the top 100 best video games quote list. UGO Networks' Sal Basile included the quote in a list of "what we learned" from The Legend of Zelda. Nintendo used the quote as a tagline for The Legend of Zelda: Tri Force Heroes, which features three different Links work together to save Hytopia Kingdom from a curse. 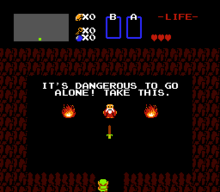 Advertising for the game included the slogan, "It's dangerous to go alone...so don't". The website Ludum Dare hosted a 48-hour contest wherein game developers had to develop a video game in that span of time with the theme "It's Dangerous To Go Alone! Take This!". The contest had 352 participants. A fan-made documentary was to be made with the title "It's dangerous to go alone! "; its Kickstarter campaign, however, was unsuccessful. The video game Adventure Time: Hey Ice King! Why'd You Steal Our Garbage?!! featured the character Jake the Dog saying to fellow protagonist Finn the Human, "Hey, man! It's dangerous to go alone!" The game was developed in part as an homage to The Legend of Zelda series. In 2013, the musical-comedy group Starbomb released a song called "It's Dangerous to Go Alone" as part of their self-titled album. The song and the music video featured Arin Hanson as Link and Dan Avidan as the old man. The song featured the old man sexually harassing Link. ^ Due to technical constraints, the original Japanese version of this line (published with the 1986 Famicom Disk System release) was rendered in single-byte katakana rather than double-byte Shift JIS characters as would be expected for standard Japanese writing. The original line reads: Hitori de wa kiken ja kore o sazukeyō (ヒトリデハキケンジャ コレヲ サズケヨウ). The line was also rendered in hiragana for Week 1 of the 1995 spin-off title, BS Zelda no Densetsu, as (ひとりでは きけんじゃ これを さずけよう). ^ Nintendo Co., Ltd (February 21, 1986). The Hyrule Fantasy: Zelda no Densetsu (in Japanese). Famicom Disk System. Nintendo. ^ Nintendo (August 6, 1995). BS Zelda no Densetsu (in Japanese). Satellaview. St.GIGA. ^ a b c Wilde, Tyler (2012-06-23). "The 40 most repeated game quotes". GamesRadar. p. 2. Retrieved 2014-05-03. ^ Plunkett, Luke (2009-08-06). "It's Dangerous To Go Alone. Take This. And This. And This..." Kotaku. Retrieved 2014-05-03. ^ Turi, Tim (2010-06-15). "It's Dangerous To Go Alone, Take These Ocarina Of Time 3DS Screens". Game Informer. Retrieved 2014-05-03. ^ Florence, Ion (2012-12-28). "It's dangerous to go alone! Take these Android apps into the New Year". Ars Technica. Retrieved 2014-05-03. ^ ""It's Dangerous to Go Alone!" - #27 Top Video Game Moments". IGN. Retrieved 2014-05-03. ^ "The 100 best video game quotes of all time". GamesRadar. 2013-05-30. Retrieved 2014-05-03. ^ Basile, Sal (2011-11-29). "Zelda: What We Learned". UGO Networks. Retrieved 2014-05-03. ^ "The Legend of Zelda™: Tri Force Heroes for Nintendo 3DS - Official Site - Gameplay Pictures, Videos". www.zelda.com. Retrieved 2018-10-26. ^ "The Legend of Zelda: Tri Force Heroes TV Commercial, 'Don't Go Alone'". iSpot.tv. Retrieved 2018-10-26. ^ Smee, Andrew (2011-06-29). "Ludum Dare 20: It's Dangerous To Go Alone!". Rock Paper Shotgun. Retrieved 2014-05-03. ^ Martin, Liam (2013-04-23). "'The Legend of Zelda' documentary seeks Kickstarter funding". Digital Spy. Retrieved 2014-05-03. ^ Drake, Audrey (2012-08-28). "Adventure Time 3DS: Zelda II in the Land of Ooo". IGN. Retrieved 2014-05-03.